A glance at my speedometer reveals the needle swiftly climbing past 70. Third gear, near redline. I begin a sweep over the double yellow to the far left. It’s raining and visibility is near zero. 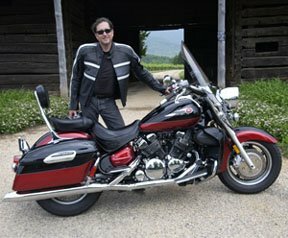 I roll off a little trying to avoid the other motorcycles and the three West Virginia State Trooper’s sedans. Suddenly we’re headed into a hairpin. The bike ahead of me brakes and my rain-covered visor turns into a translucent red wall. Terror overcomes excitement. I flip up my visor and search for the exit of the turn just in time to shift my weight for the switchback. Welcome to the West Virginia Mountain Classic… a bicycle race! Forget roadracing, touring and motocross. The most exciting motorcycling today is riding for bicycle races. Don’t believe me? When was the last time you crossed a double yellow line to pass a state trooper at 25 mph over the legal limit? 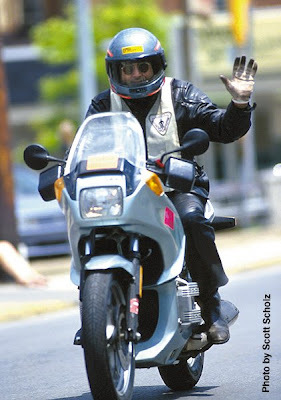 My introduction to motorcycling for bicycle races was by invitation to ride for the 1990 Woodstock Classic. It was pretty mellow. A few hills. Nothing like I was to experience later. My job at that event was to carry an official with a time board. Our duties had us passing the racing bicyclists again and again. This is a little easier said than done. When passing all the cyclists, safety is the priority. It is not unusual for the unwary motorcycle to be trapped by the peloton (the official name for the pack of cyclists in a race). After two Woodstocks, it took all my skill and perhaps a little divine intervention to survive the West Virginia. The West Virginia Mountain Classic was big time. The 531 mile, 6-day stage race drew riders and teams from 19 countries. It offered $75,000 in prize money and lots of goodies kicked in by corporate sponsors. In biking circles the Classic was billed as the first part of an American triple crown of bicycle racing. The Thrift Drug Classic in Pittsburgh and the Core States Classic (which draws upward of half-a-million spectators) being the other two legs. Motorcycles are used to carry officials, photographers and, most importantly, TV cameramen. On special occasion, if enough motorcycles are available, VIP’s can catch a ride. There is no better view of the race. Motorcycles are only a small cell of the huge bicycle race caravan. The caravan begins with as many screaming police cars as the promoter can glean from the local authorities. Then follow the motorcycle marshals who block all cross roads, providing a “rolling enclosure.” The vehicles immediately in front of and behind the peloton carry the two commissars. The commissars control the movements within the race caravan. The peloton is the nucleus of the race caravan and dictates the speed of the entire caravan. This fluctuates from as fast as 60mph downhill to 5 mph uphill. Following the rear commissar are all the support and team vehicles. This is how it works. You are riding behind the commissar and your photo-passenger needs to get a picture of Greg LeMonde. So you meander your motorcycle through the caravan to the commissar’s position. Then you politely gesture. If he deems it safe, is in a good mood, has eaten recently and hasn’t seen you screw up yet, he will wave you on. You then enter the peloton put your photo-passenger next to Greg Lemonde for a few seconds and then blast out of there before you anger the cyclists and are squirted or pelted with water bottles, or worse, piss off the commissar. At the West Virginia, the free accommodations for volunteer motorcyclists were great. We spent one night at the Snowshoe Mountain Ski Resort, after which the weather was so poor that the officials decided to start the race at the bottom of the mountain. A wise decision considering the intermittent rain, dense fog and overall hazardous road conditions. On another my room included the use of an outdoor Jacuzzi and an indoor whirlpool. For this race, I was carrying the Mavic mechanic who provided neutral support for all the racers. We dutifully rode in front of the lead commissar. Have you ever tried maintaining the same speed as the vehicle directly behind you? Downhill, the acceleration of a modern, lightweight bicycle with a professional racer is astronomical. Which is why all the motorcycles and cars blast out of the way before the peloton reaches the crest. Every racecourse has at least one memorable turn that clearly illustrates the sadistic intent of the course designer. In the Charleston, West Virginia circuit race, it was an acute off camber left hand turn with a manhole cover in the middle of the best line. For eight laps, I tried to finesse that turn. Just as I had finally gotten the hang of it, the driver of the press vehicle in front of me stalled his car. I swerved to the left, happy not to be spending the rest of the race in the trunk of a Subaru, and left him to be rear-ended by the commissar or eaten by the peloton. As National Editor for Southwest Cycling Magazine, Scott’s duty was photos. We made a great team. Scott knew exactly who he wanted a picture of. Even where the racer might be. I put him there. On one circuit we even lapped the peloton (remember these guys are going pretty fast). At the motorcycle briefing we were warned about the two dips after the railroad tracks. I had ridden over them six times this race. Scott had just shot a photo of a breakaway. It was time to blast. We passed the commissar. We passed the motorcycle marshals. We crossed the tracks. I yelled hang on. I really don’t know what happened next. I found myself riding the pegs and trying to keep the bike upright. I knew Scott was still on the bike. I heard his screams. I’m told Scott bounced off the seat about three feet. I also know that when Scott came down, he bent my right passenger peg down at a 45 degree angle. “Kalan, you’re killin me, “ was all he said as I left him at the finish line.